Going out for dancing when living in a cold climate region is a challenge. You want to stay warm during the commute, but not sweat on the dance floor. In addition to all the reasons why nobody wants to sweat on the dance floor at a social dance, there is also a climate reason. As you get outside and you are sweaty, the sweat cools. Well, it is its biological purpose to cool your body. However, at below zero temperatures, you do not want that your body is cooled when you go outside. The solution? Wear your dance outfit and put warm stuff over it for the commute. At the dance hall, take the layers off until you are back in your dance clothes. An alternative would be to change in the restrooms. However, I find that way to complicated as the stalls are so small. Thus, I rather “disguise” my dance dress as shown in the photos with a cashmere sweater or cardigan. When I know that the dance place is usually cool I even put a lace T-shirt under my high-low hem dance dress. 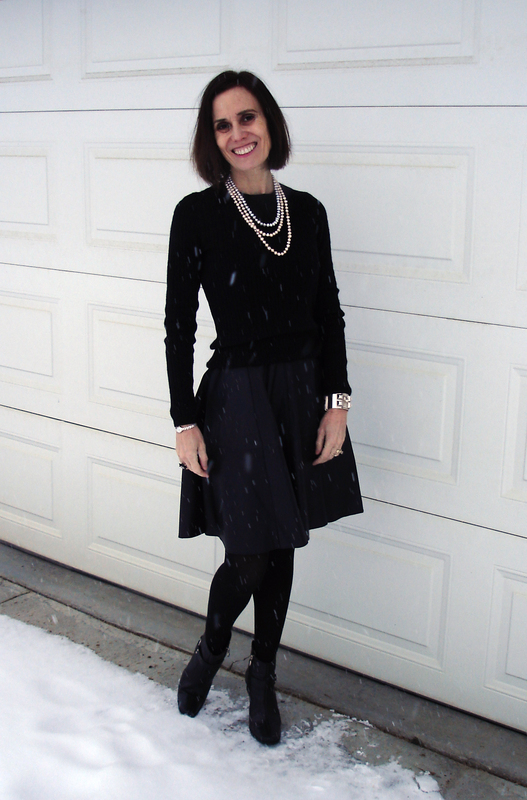 When it gets very cold, I even wear a skirt over the skirt of the dress. Some of my girlfriends even wear jeans under their dance dresses for the commute to the dance hall and back home. Thus, what about the sweat after the dance when you danced too much, and/or too wild? Just wait in the dance hall in your dance dress until the sweat is evaporated and your body has cooled down before you put on the sweater and other protective wear for the way home. And when you go to a dance in the middle of winter, do not forget to plug in your car. Sitting 15 minutes in an idling car until you can put in a gear is a recipe for a cold even when you waited a little after the last dance to cool down. What do you wear when you go out dancing? Do you layer to stay warm on the commute and when warming up your car? Let me know by email, I am curious.